Published: Dec. 13, 2011 at 05:14 p.m.
Ndamukong Suh, left, and James Harrison could face substantial suspensions if they continue their illegal hits. 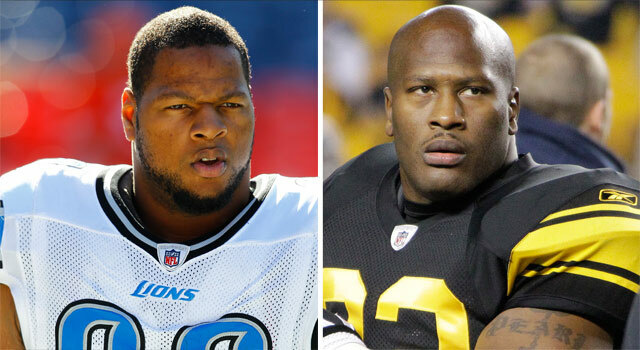 Detroit Lions defensive tackle Ndamukong Suh and Pittsburgh Steelers linebacker James Harrison could face substantial suspensions -- including playoff games -- if they repeat the transgressions that led to their recent suspensions, according to a league source. Harrison was suspended Tuesday for Pittsburgh's game against the 49ers on Monday for a helmet-to-head hit on Browns quarterback Colt McCoy. NFL Network insider Jason La Canfora reported Harrison has requested an expedited hearing and a date has been set for his appeal on the league-issued discipline that also will cost him a game check. Suh returns this week from a two-game suspension -- which he appealed and subsequently lost -- for pushing on the head and stomping on the arm of Packers offensive lineman Evan Dietrich-Smith. The Lions went 1-1 in Suh's absence. The source indicated that there might not be much latitude for Suh and Harrison in the future since they've been warned and fined for previous infractions but still have pushed things to the point of suspensions. Harrison was fined six times from 2009 to '10. "Three games, four games, five games, six games? It could happen depending on the circumstance," the source said. "They are repeat offenders, which mean suspensions are more likely." The purpose of a severe punishment like a suspension is to get the player to change his behavior, in part because the player's absence could affect his team, the source said. A suspension also doesn't place the sole onus on the player. The coaching staff, management and even teammates therefore could be prompted to hold that player more accountable. Lions coach Jim Schwartz recently imposed a zero-tolerance policy after his team's repeated abundance of egregious penalties. The team has the right to suspend a player and not leave adjudication to the NFL, as a player cannot be subject to punishment by the team and the league. Pertaining to Harrison specifically, the league felt there was little choice but to suspend him because the hit on McCoy was the third consecutive time in the past 13 months he has struck a "defenseless" quarterback with the crown of his helmet. The NFL cited the hit on McCoy as the fifth "illegal" hit to a quarterback with his helmet in the past three seasons. Harrison was fined a total of $45,000 for hits to Bills quarterback Ryan Fitzpatrick and Saints QB Drew Brees in Nov. 2010. He was cited for using his helmet on the tackles, although he did not strike either quarterback in his head. Although McCoy broke the pocket and was running with the ball, Harrison's hit to the head with the crown of his helmet was the dominant factor in deciding to suspend him, according to the source. "He could have hit him anywhere else but the head and probably have been fine," the source said.